Ancient Stones - Borders - 070 Stone Circle, Ninestanes Rig, Newcastleton. 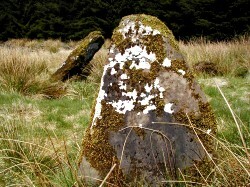 The stone circle on Ninestone Rig is a small circle of eight earth-fast stones, with a ninth stone fallen inwards and lies prone. All the upright stones lean inwards but seem to be in-situ with six of them broken to mere stumps, not exceeding 0.60m in height, and of the remainder one is a regular monolith measuring 2.10m while the other, which leans less sharply, measures 1.30m in height and has a chisel-shaped outline when viewed from within the circle. The "circle" is in fact slightly oval and dates from the Early Bronze Age. From Hawick, take the B6399 for Hermitage and Newcastleton. The stone is in the coniferous plantation after Whitropefoot, about 2 miles before Hermitage. The route to Ninestone Rig Stone Circle is signposted form just north of the above mentioned bridge. Simply follow the fence line or forest end running south east. A style marks where to enter the forest and the circle can be found by following the firebreak. On grass verge beside stone road bridge crossing Whitrope Burn, just after forestry ends. The nearby Hermitage Castle tells an interesting tale. Once the home of Lord Soulis, better known as "Bad or Evil Lord Soulis", an enthusiastic black magician who used the black arts to perpetrate many terrible deeds. His favourite past-time seems to have been abducting young children from the neighbourhood and keeping them in the dungeon, probably the same dungeon where Sir Alexander was later to die, until he required them for his foul ceremonies. Following the massacre of Cout of Keilder and his party, after treacherously inviting them to a banquet at Hermitage, and further disappearances of local children, the local people petitioned Robert the Bruce to "dispose of him". Robert, already extremely annoyed at the stories he had heard about the happenings at Hermitage, agreed and joyfully the locals marched up to the castle, seized the evil lord and dragged him to a spot known as Nine Stones Rig, clapped in irons. There they boiled him in a vat of molten lead. The ghost of "Bad Lord Soulis" has been seen many times accompanied by his trusted servant Robin Redcap and sounds of demonical laughter have been heard at night in the deserted ruin. The stones on Ninestanes Rig, near Hermitage Castle, as one story goes, are also supposed to commemorate the Britons of Strathclyde who, under Aidan, were defeated with great slaughter by Etheifrith, king of Bernicia, at the battle of Degsanstane or Dawstane in A.D. 603. I prefer the earlier tale, myself. "On the top of Nine Stone Rig there is a whole street of circular pits running directly from the stone circle. They are planted at regular distances, and fairly close together, and they gauge from 8 to 10 feet deep, with rather more of diameter. They have in most instances a gently sloping side, in some more marked than others, and runs in a kind of curve towards the north. These, or some of them, may have been originally natural subsidence's, although their number, regularity and uniformity of size are against that idea. All the suggestions are that these formed the shelters of the men who set up the Circle and heaped up the barrow... The ground is dry and lying as the pits do, just a little over the edge of the Rig, there would be no danger of flooding". "No archaeological significance could be attributed to these 'pits' which lie a few metres NNE of the stone circle. They appear to be simply caused by natural subsidence's in the mossy ground."